I recently got cable tv back (we only get it for football season) so I'll have to check it out. *ARGH*! The link's gone! The YouTube Account terminated! I'm not getting anywhere here.... I'll give it one more day and I'll have to pull this page. Is there another link available? I saw the video before it was taken down, it was thought provoking. Police officers took the photos at the crash scene. They were there moments after the crash. I'll keep checking to see if I can find a video link anywhere. I'll keep looking to see if it's available on video. Here is a link to a review of 'The Ghost That Screamed'. Edited by MacCionoadha' Bean-Sidhe, 30 October 2015 - 12:53 PM. Here is another link. I think it was pretty compelling and thought-provoking. I watched the segment just now. It said the image may be two images of the kid as the crash went down. To the right of the screaming face is another fainter one that's kind of looking downward and facing the camera. The youth was...at the time of the crash...sitting with his back against the passenger door (facing the same direction as the officer who took the photo). 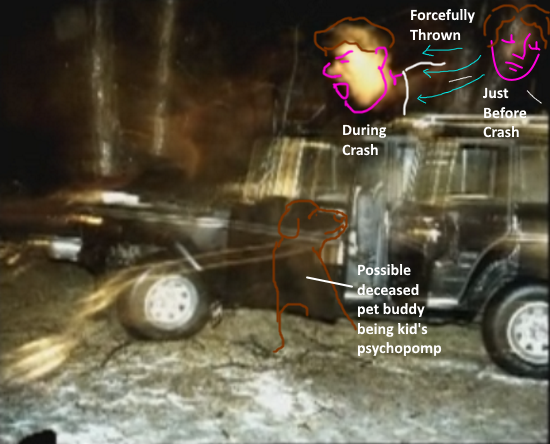 The two images show a composite of the kid being thrown forward into the dashboard of the car (screaming as he does so). There may also be a ghost dog in the photo, too. In front of the ajar driver's-side door, there may be a chocolate-Labrador dog sitting there looking over his shoulder at us. The youth apparently had a pet dog who passed away and the dog's there to help the kid cross over peacefully to the other side. Edited by SpukiKitty, 06 February 2019 - 09:53 PM.